Marcio, how do you like Zloty Tur? – First, I want to thank Igor and all the Organizers or the brilliant team that made everything happen with such a professionalism.... I was impressed. Thanks for the hospitality too, I won't forget. And yes, I loved being part of the Zloty Tur for the first time, it was a great experience. Are you pleasured with your result? – I am definitely not happy with my results, my right arm I never got pinned, lost on fouls, I felt that if I didn't do any mistake I could've made to final match in 105 kg. Can you say that it is harder to pull in Europe? 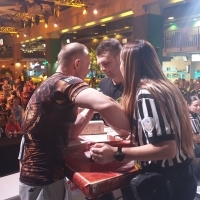 What is the difference between American and European armwrestling? What can you say about your rivals? Who was the toughest?